I once watched an interview with Carrie Ann Moss, back when she was promoting "Red Planet" , in which she said that wearing a space helmet for the film had been a very difficult thing since she was claustrophobic. She joked and said something like “one fear down, many more to go”. Preheat oven to 180°C/350°F. Lightly butter a 20x10cm (8x4in) shallow ovenproof baking dish**. Layer one sheet of the filo pastry on a clean, dry surface (keep the other sheets covered with a clean, damp kitchen towel to keep them from drying out), forming a 30x20cm (12x8in) rectangle, brush with melted butter and cover with another sheet. Repeat the process until you used all the sheets. Line the prepared baking dish with the filo sheets. In a bowl, mix together the spinach, ricotta, feta and parmesan. Top the pastry with the cheese mixture. In the same bowl, whisk together the eggs, cream, chives, salt and pepper and pour over the spinach mixture. Brush edges of pastry with remaining butter. Bake for 30-40 minutes or until egg is set and pastry is golden. * place the spinach leaves in a pan of boiling water for 5 seconds, remove with a slotted spoon and immediately soak in a bowl of ice water. Remove from the water and squeeze excess liquid. I can imagine the cracking noise when slicing those tarts. Excelent for the summer lunch with a salade. OMG..the pie looks tasty,TFS..you giving me idea for mother's day picnic dish ,Thank you Patricia, Have a wonderful mother's Day.. I love the look of this pie! I think phyllo is a great product to work with and I love the many applications. It's so nice to see it in recipes that aren't sweet (I'm addicted to baklava). Thanks for the inspiration! Congrats on the filo. This looks wonderful! This is gorgeous and looks so yummy. yumm definitely making this one...your blog never fails to make my mouth water! I have a dream of one day conquering my own fear to actually make homemade phyllo--when I do I will make this pie. The crust looks so perfectly golden and crispy, and the filling sounds incredible! this looks great! 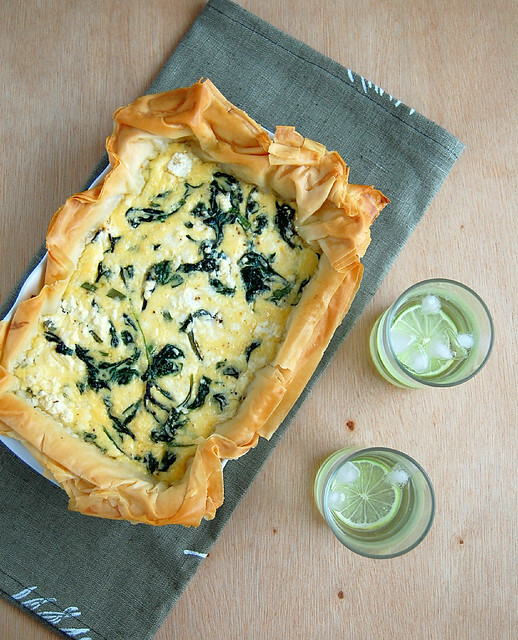 i love combining spinach and cheese - especially feta... reminds me of spanakopita. I can't wait to try this! Just made it today, and would definitely make it again! If you haven't tried it, you should. Hey, Rachel! That is such great news, I'm glad you liked the recipe!